BERWYN, PA - On a beautiful Sunday afternoon, Easttown Township Resident Tim Guttman was outside in his yard doing leaf clean up. Just like he did so many times before, he was using his leaf vacuum and enjoying time outside. Coincidently, his wife Gretchen, who was inside the house happened to look out the front window and saw Tim on the ground not moving. Tim had suffered a sudden cardiac arrest and was in a life or death condition. 9-1-1 was activated at 3:59 p.m. on November 11th, which dispatched Berwyn Fire Company for Fire and EMS responders as well as the Easttown Township Police Department. While waiting for responders, the Chester County Department of Emergency Services 9-1-1 call-taker was providing CPR instructions and early CPR was initiated. Easttown Police arrived within 3 minutes of dispatch and applied an automated external Defibrillator (AED). One shock was provided and CPR was continued. 2 minutes later, EMS Captain Michael Baskin arrived and assisted the police with medical direction. A 2nd shock was delivered as the Ambulance and Paramedic arrived within 7 minutes of dispatch. Upon taking over medical care, the AED was replaced with a heart monitor to allow Firefighter/Paramedic Todd Taylor to manually recognize heart rhythms. 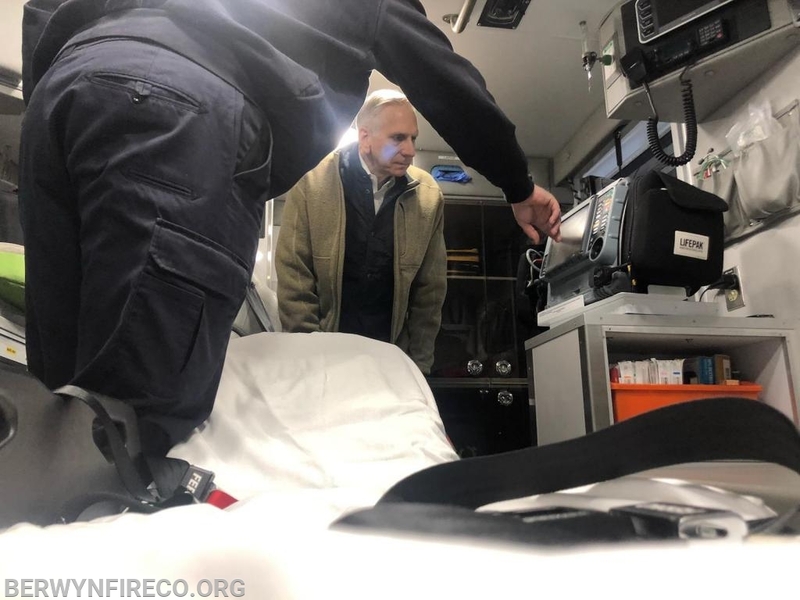 8 more shocks were delivered over the next 10 minutes, important medications were given, a mechanical CPR machine called the 'Lucas' was applied and oxygen delivery was given. 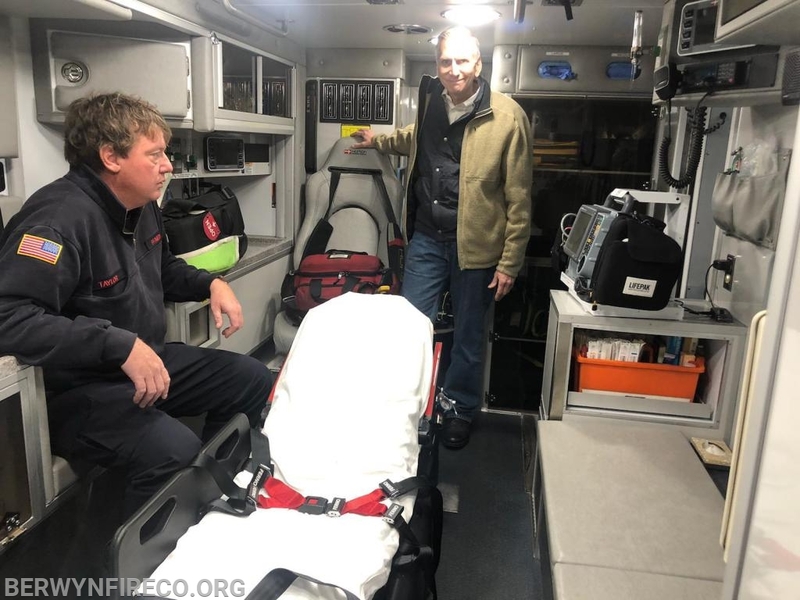 By the time Tim was being loaded into the ambulance after only 15 minutes, he began to sustain his own pulse with a more normal heart rhythm, began to increase his blood pressure and was showing signs to attempt to breath on his own. Tim's care was turned over to the Paoli Hospital emergency room, cardiology doctors and ICU nurses. Ten days later, on the day before Thanksgiving, Tim was home. While he does not recall the day, he has no deficits and says he feels great! On December 1st, Tim and Gretchen visited the fire house to meet with the responders from the fire company who participated in saving his life. Tim and his family are very grateful for all of the responders and hospital staff who did an outstanding job. 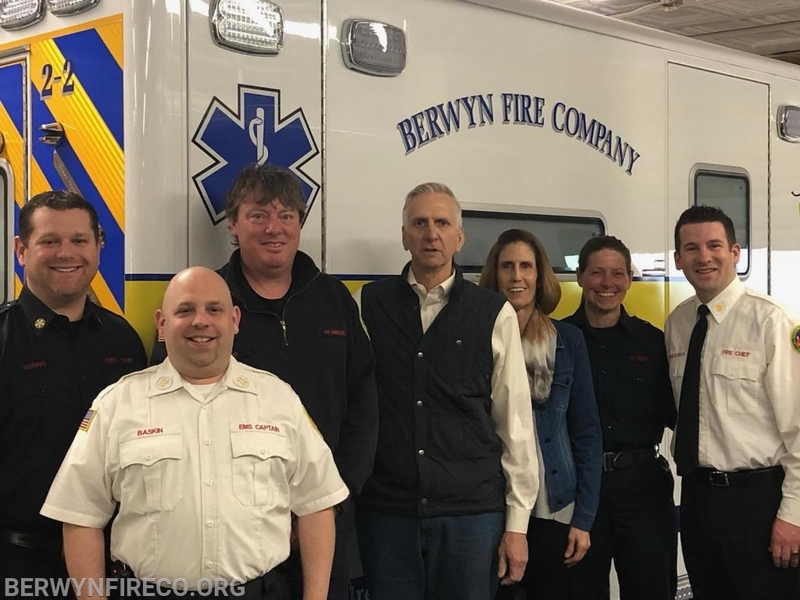 The Berwyn Fire Company responders who were a part of this emergency call were EMS Captain Michael Baskin, Fire Chief Eamon Brazunas, Career Lieutenant Sheryl Drach, ALS Coordinator Todd Taylor and Past Chief Matthew Norris. Over 100 years of combined experience! It is a unique experience to receive follow-up from our patients. Berwyn responders see over 2,200 patients per year, and rarely do we get to meet patients after the fact. Tim and Gretchen spent some time sharing their story, learning about the fire company and seeing some of the medical tools that were used to save Tim's life. This is a true example of the chain of survival starting with bystander CPR, early defibrilation, ALS intervention, emergency room and tertiary hospital care. We wish Tim a continued speedy recovery and all the best! Tim Guttman learning about some equipment. The Lifepack 15 Heart Monitor is used to display ECG, pace the heart, shock the heart and monitor vital signs. Todd Taylor and Michael Baskin answer questions about some of the equipment and operations of Berwyn EMS.